Warmer weather in the U.S. usually means iced tea, sweet tea, and a tea drink that is growing in popularity here (as well as in Europe). It is sometimes called “bubble tea” and sometimes “pearl milk tea” (or “boba milk tea”). Having spent many years as a technical writer where the difference between “hit Enter” and “press the Enter key” were important (especially since some people take things rather literally), I’m going, just for the fun of it, to pick apart both names. Sit back, relax, sip your tea, and take a linguistic journey. A pearl, in contrast, is solid. It is also spherical (sometimes). True pearls are those iridescent beauties created by clams when some irritant gets inside their shell. We call various things “pearls” since (a) they are spherical and usually about the size of a salt-water pearl (fresh-water pearls are more irregularly shaped), or (b) because it’s more poetic and/or colorful than saying “sphere” or “ball.” Would you like to drink a tea named “Dragon spheres” or named “Dragon pearls”? As is often the case with marketing, words matter. Based on the above, I’m thinking that “pearl milk tea” is a more accurate term. But wait, there’s more to this. My guess (and one supported by various online sources) is that the term “bubble tea” is a mispronunciation of “boba.” Of course, it could just be that someone thought it seemed more fun and whimsical to say “bubble” than “pearl.” Or it could possibly be another of those translation mix-ups. The English language has around 100,000 words, or so it is claimed by many linguists, and many of these words are subtly different to us but translate as meaning the same thing in other languages. When going from those languages to English, therefore, they are presented with a host of options and do their best to pick the right one. Not always successfully. Based on the mispronunciation theory, “bubble tea” is just as accurate as “pearl milk tea.” No easy answers, darn it! Pretty simple here. 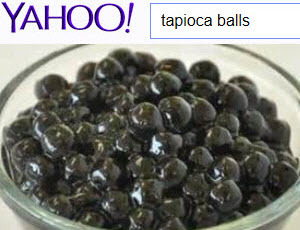 They are chewy tapioca balls. The Chinese slang term for them is bōbà (波霸) meaning “large breasts.” Seriously! I couldn’t make up something like that if I tried. Tapioca is a starch from a plant that originated in Northern Brazil called Manioc (Manihot esculenta). It proved so popular, that the plant was soon being cultivated throughout South America. Traders and explorers brought some of these plants with them to other ports of call in the West Indies, Africa, Asia, the Philippines, and Taiwan. 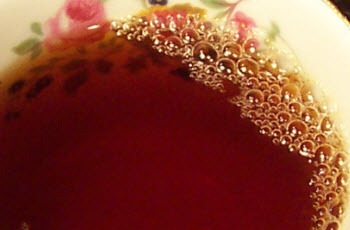 The Taiwanese were the ones to start using it in this tea-based drink (usually Taiwanese black tea). Milk, fruit, and ice are other common ingredients, with a wide variety of flavors available. Green tea versions have become popular, too, as people started touted green tea as healthier than black tea (the jury is still out on that, with some recent studies supporting the claim and others contradicting it). No matter what you call it, give some a try as warm weather approaches. It’s sort of a drinkable tapioca pudding that has tea in it. Wow!